*We attended one more graduation party today for a special special young lady. Sylvia West was one on of the students that started talking to me at least her junior year to make sure she was doing everything she could to prepare for her senior year. And all her hard work paid off. She was diligent in filling out scholarship applications. She applied to colleges. She applied for financial aid. She decided she wanted to attend Lewis Clark State College. 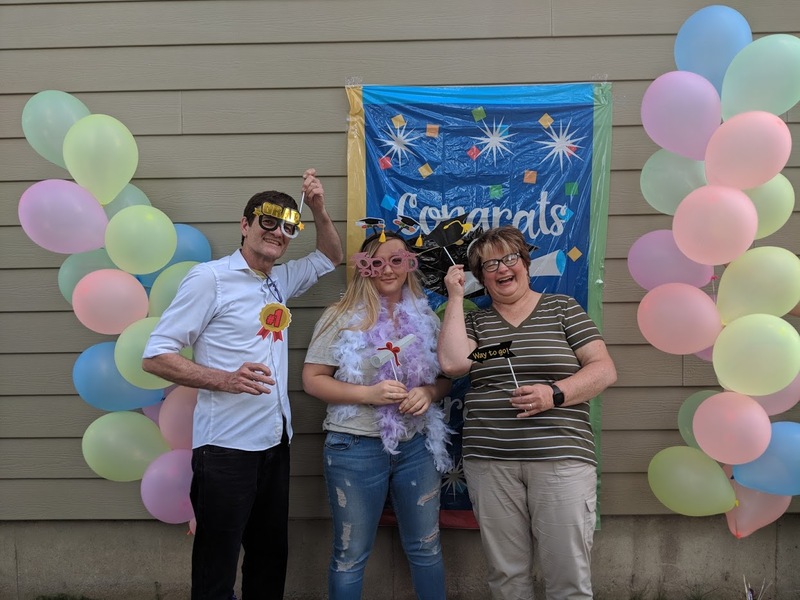 She was the winner of the National Horatio Alger scholarship (they only pick one applicant in the state of Idaho), and with her other financial aid, she will use very little of her own money during the next four years she is in college. I am going to miss all the seniors, but Sylvia will always hold a very special place in my heart. It was fun attending her party today, and see her surrounded by such a loving family her are also very proud of her. Thank you Aaron and Katy West Stovern for inviting us to be a part of Sylvia’s celebration. Because of the people who support her in her life and love her, she is going to have a bright future ahead. *Today was our day to have family dinner. Before we headed to the grad party, I decided to roast the chicken so it would be ready. A few years ago I had made some jars of preserved lemons. I had two left in the refrigerator. I grabbed on of the jars, and stuffed the chicken with the lemons, as well as putting some under the skin of the chicken. It infused the chicken with a wonderful lemony flavor. I also made a cauliflower mash dish (lots of heavy whipping cream, butter, and some chives on top), some marinaded green beans put in foil packets and grilled on the bbq, and grilled Romaine lettuce, drizzled with avocado oil, Balsamic vinegar, with cut up grape tomatoes and Romano cheese on top. Very nice. *We had a storm roll in early evening last night, so as the wind started picking up, the rain starting to sprinkle, and as we heard the sound of thunder in the distance, we decided our family party had better break up and people should get home. It was quite a spectacle for a bit with thunder, lightening, wind and rain. *As I reflect on the weekend, I am so excited to see what the future holds for the Class of 2018. Being my last Gear Up group, they will all hold a special place in my heart, and I wish them nothing but success in their future. I have shared about this in the past, but often graduation ceremonies cause me a bit of social anxiety. But this year was different. I didn’t feel in a funk, or anxious, or often I felt inadequate. I had none of that this year. Again, this class was a great group to end my career as a Gear Up Site Coordinator.